A ponytail is one of the most convenient hairstyles out here. I love it because you can easily change up your look switching between a low ponytail for errands and a high ponytail for dinner out. Today’s tutorial is a spin on an older tutorial from last year, the Dutch Fishtail Ponytail. This style features a dutch braid and fishtail braid combo whereas last years was a dutch fishtail braid. I love both and think they’re a super sleek way to easily amp up your summer pony. I’d love to hear what you think and which one you like best! To prep the hair I curled all of it away from the face with a 1″ curling iron. You can do this style with any hair texture whether straight, wavy or curled. Step 1 / Create a deep side part; I put mine on the left side. Step 2 / Clip off the top section to keep it out of the way for the braid. Step 3 / Pick up a small section on the left side near the hairline and divide it into three equal pieces for the braid. Step 4 / Begin a dutch braid by crossing the side strands underneath the middle strand. Step 5 / Start incorporating small sections into the braid, continuing the braid so it goes horizontally above the left ear towards the back of the head. Step 6 / Now stop adding in hair and do a few extra stitches of a regular dutch braid before tying off the end with an elastic band. Step 7 / Remove the clip from the top of the head and brush all of the hair into a ponytail. Step 8 / Bring the braid in last so it doesn’t get lost underneath other hair and tie it all together with a hair band. Step 9 / At this point you can go back through the braid and pull on the edges to make it wider so it shows up a little better. Step 10 / Divide off a small section of hair from the top of the ponytail and split it into two equal sections. Step 11 / Create a fishtail braid by crossing small sections from the outer edges over to the opposite side and braiding all the way to the bottom. Step 12 / Loosen the sides of the braid to make it fuller and tie it off with an elastic band. Step 13 / Divide off a small section from the ponytail, wrap it around the hair band and pin it underneath with bobby pins. Step 14 / Spray the style with a medium-hold hairspray and smooth down any flyaways. 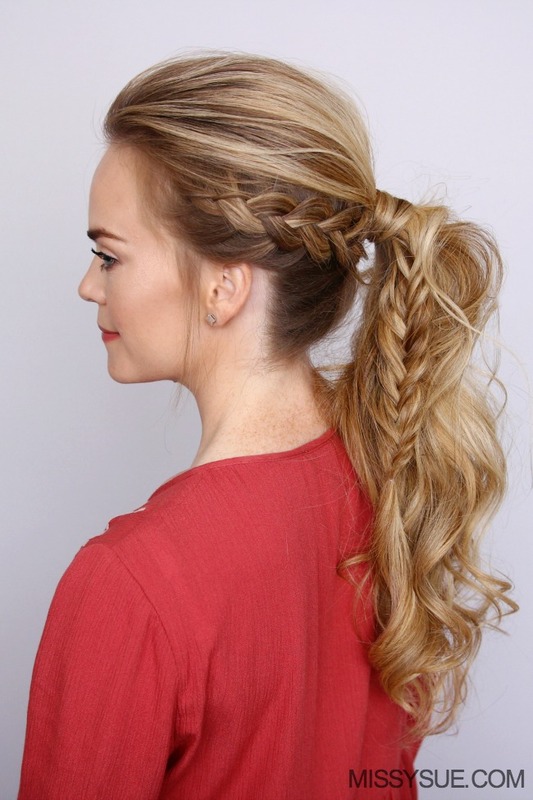 This triple ponytail is a fun spin on the typical pony. I recently spotted Blake Lively roaming an event with a similar hairstyle and wanted to give it a try. Her’s was not exactly the same as this but I took her style and adapted it to fit my own. This is a fun three-tiered ponytail that slightly resembles a mohawk. It looks like a regular old ponytail from the front but once you turn your head, it is definitely a party in the back. 1 / Beginning at the front of the ears, section off the hair at the top of the crown. 2 / Smooth down the front and secure this section with a clear elastic band. 3 / Taking a small strand from underneath, wrap it around the band and secure with a small hair pin. 4 / Next, draw a line straight back from the top of the ear and repeat steps 2 and 3. 5 / Gather up the remaining hair and repeat steps 2 and 3 again. 6 / Gently loosen the top of the hair to create a mohawk effect and finish with hairspray.